As a John Deere employee, we all begin being told we work for a global company. We see the maps. We know who makes each model. Even with all of that… it is still easy to get into your day to day role and forget what “global” means. Global Company? Yes indeed! 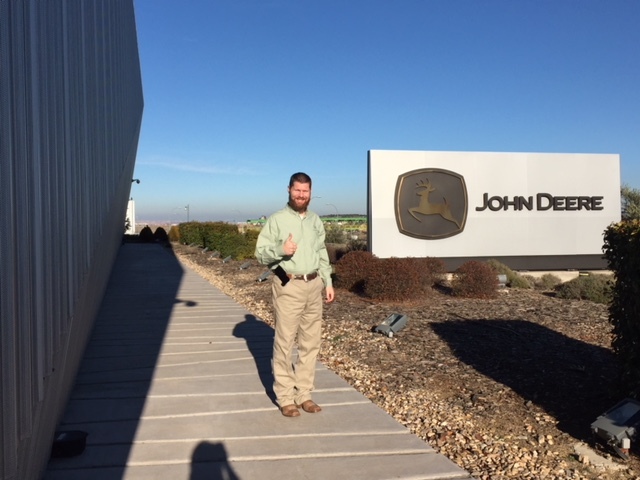 A half a world away, I serve John Deere in the capacity of Territory Customer Support Manager and have the privilege of driving sustainable results with global initiatives, the same initiatives Juan Carlos discussed with our LSU Ag Leadership Class XV. No matter where you are in the world and no matter how advanced the technology becomes, we still have the same challenge every year of cultivating the ground, planting a seed, nurturing that seed and hopefully one day harvesting a fully mature plant that is producing a maximized yield. It was great to see that our dealers can get the same world-class training in Spain and Portugal that we provide at our factories and training facilities in the US and all around the world. No matter where you go, that leaping deer stands for quality, innovation, integrity and commitment; our core values. These are the moments you KNOW you are apart in a global company!